Okay, so this is a book review, but there's a lot of story behind why I read this book, and I very much want to share it. I started to include the story of how I went from "I'll eat anything if it tastes good" to "no more soda" to vegetarianism to veganism. All in less than one year. But as I wrote that into this review, it started to feel less like a review and more like a story of my family's dramatic dietary changes over the past two months. To keep this review actually about the book, I will post my story in another post in a few days. SUMMARY: Young readers edition adapted from The Omnivore's Dilemma. Journalist Michael Pollan investigates where our food comes from and what readers can do to take charge of their own health. REVIEW: The author of this book, Michael Pollan, appears in the documentary Food, Inc., which was the first of my food documentary binge a couple of weeks ago. The Omnivore's Dilemma does not advocate for a vegan diet in particular; rather, it follows our food from where it begins (industrial farms) to where it ends up (on our plates). There is some detail about the care and treatment of animals raised for meat on industrial farms. The book includes plenty of detail about how the animals we eat are kept in filthy, crowded pens and fed corn, something their bodies are not designed to digest. Babies are separated from their mothers early and pumped with antibiotics, which in turn, go into our bodies when we eat these poor animals. My favorite part of this book is Pollan's assertion that almost all the food we eat in the USA comes from government-subsidized corn. Soft drinks, batteries, glue, dog food, artificial sweetener, coffee creamer, ketchup, marshmallows...all are made from corn. Supermarkets in the US have tens of thousands of different products, but the majority of them are corn-derivatives. With all that corn in our food, how diverse are our diets, really? I do think this book does a good job breaking down food science for teen readers, and I would purchase it for my library (we also have the book Food, Inc). It will not be the most popular book in the library, but it's a must-read for teens interested in nutrition and health. It's an easy, engaging read for teens and adults who want to know more about the food they eat. My only criticism is that at 400 pages, The Omnivore's Dilemma is overlong. I think Mr. Pollan makes his point well, but I felt a little "beat over the head" with it. Maybe I feel that way because by the time I read it, I was already 100% sold on the vegan diet. I had already watched Food, Inc, as well as five other food documentaries. I had already read The China Study, which is a big part of the Forks Over Knives documentary. It wasn't going to take much to convince me that the American food industry produces food that isn't designed to be healthy for human consumption. It's all a money-making machine that couldn't care less if Americans are fat and sick. 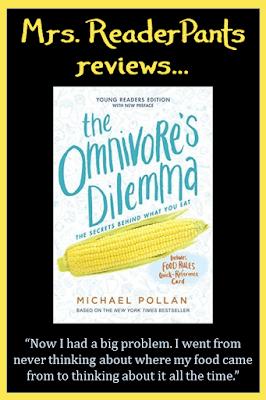 THE BOTTOM LINE: The Omnivore's Dilemma gives teen readers a glimpse into the food industry in an easy-to-understand, engaging way. It won't be the most popular book in the library, but it's a must-read for students interested in nutrition and health. STATUS IN MY LIBRARY: We do not have it, but I will order it eventually. My current library has so many needs, and this book is not my priority right now. Quality of information: 4/5--Contains lots of detailed information, but it does get a little repetitive. Documentation of sources: 5/5--Includes an extensive list of sources at the end, broken down by chapter. Engrossing: 4/5--I had a hard time putting it down, but I did also skim some parts. Appeal to target audience: 3/5--As much as I would like them to, I don't see many teens picking this up on their own. I do see many adults enjoying it, as well as teens interested in health and nutrition. Appropriate length: 4/5--400 pages is a little lengthy for this topic. I am very interested in hearing your personal story. Thank you for the book review.